After a beloved local bookstore closed last December and another store was lost to economic bankruptcy, Vanderbilt, once known as the Athens of the US, became nearly barren of bookstores. A collective panic set in among the city’s reading faithful. 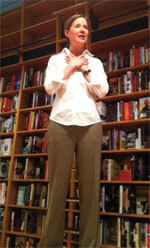 But they have found a saviour in Ann Patchett, the best-selling novelist, who grew up in the city. Patchett is well aware that brick-and-mortar bookstores are closing regularly under pressure from online sales and e-books. She said she is counting on her store to drive home a sharp message: buy books at independent stores, or the stores will go away.